A Eulogy is a speech to farewell a person who has passed away. In the aged care industry, staff are occasionally asked to deliver eulogies; either by the family of the departed or by management. In this article I have residential care staff in mind. If you are asked to deliver a eulogy, consider it a great honor. You may have been requested because you are kind, capable and compassionate or because the person held you in high esteem or because management consider you competent or, all three. Your job is to deliver a fitting memorial to those present by bringing the person to life for a few minutes; by giving all present a little comfort with a light, positive portrayal of that person. I have delivered half a dozen eulogies for my workplace and my recommendation is; keep it short. There is not much time to write, rehearse or prepare for obvious reasons. The rule of thumb for the length of a eulogy is 3 to 5 minutes. 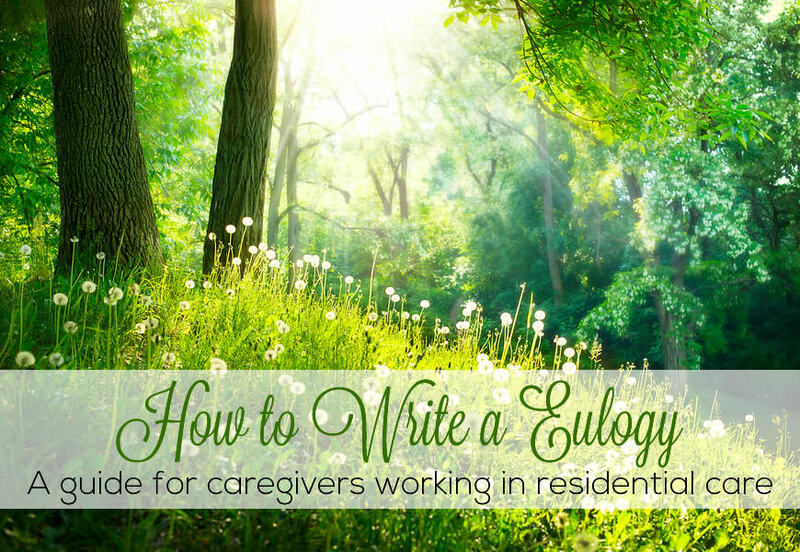 If you know someone who has written a eulogy before, ask them for help. Remember that people are there to mourn and also to celebrate the life of the person. A eulogy can be spontaneous or have a chronological style. It is my opinion that the chronological style is rather lengthy and more appropriate for relatives to write. A spontaneous eulogy centers on the recent past and other staff members can help you with the outline. Focus on the person's life while in residential care. Choose words carefully, they will be treasured by the family and friends of the deceased. Focus on the positive aspects of the person and pay respect to them in a caring and tender manner. Don't turn the person into a saint. Your words should paint a picture of the true person; character, humour, achievements, friendships. It is nice to share something amusing the person said or did in the past. You may also add some random, interesting facts and anecdotes. What can you remember from conversations? Did they have a favourite activity? What did they like to talk about? Did they have an ironic/sardonic sense of humor? Did they enjoy the company of another resident? Did they look forward to family visits? Were they close to anyone in the family that they talked about? Did they enjoy bus trips? Did they talk about WWII? Was religion a part of their life? Did they enjoy nature and talk about it? Did they talk about the past with joyfulness? Did they consider themselves blessed? Did they have any other special qualities? Once the outline is ready, condense it to a size you feel comfortable with. Then ask someone to review it for you. Start with a poem or a passage from the Bible or Quran if you like. Another alternative is to sing a song accompanied by a guitar. Rehearse your spech in front of the mirror a couple of times. Pause as long as you need to and take a breath before re-starting. Speak to the audience as if you were speaking to a friend. It is almost unavoidable to show emotion so don't worry about a few tears. If you are a very emotional person, take a backup person with you for support. "Silvia was an unassuming, kind lady, very protective of her privacy. Therefore I am not going to talk about her past history, I would rather like to tell you what kind of person she was during the past 4 years that I have known her. Silvia was a Hairdresser and she loved to go to our salon on Wednesday to talk to the hairdresser and give advice to customers. Having no children of her own, she was often visited by her two nieces Linda and Trish with whom she had a close and loving relationship. Silvia loved children and she never missed our fortnightly playgroup when a crowd of toddlers came for a visit. Earlier this year she celebrated her 90th birthday and the all-day party was unforgettable. She may have gone but the warmth she radiated will stay with us for a long time. She will be certainly missed by all who knew her. May you rest in Peace Silvia". "Bert was a charming, enthusiastic, quick tempered and generous man. He was proud of his Scottish heritage and his four children and seven grandchildren. His arrival at (facility's name) changed the consensus in our recreation room. He soon became a leader; organizing card games, choosing venues for bus trips, and befriending and protecting those whom he perceived as 'underdogs'. He loved John Wayne's movies and had everyone watching them. His quick temper sometimes got him into some strife, but it was always quickly resolved because Bert was also fair and could see the point of view of others. May you rest in Peace Bert. It was a privilege knowing you. For all that we have been spared. Many years ago I was asked by management to deliver a eulogy for one of our residents. Ralph was an orphan and an unmarried man with few friends and he passed away shortly before his 88th birthday. I am sharing this with you because it was my first eulogy and despite knowing Ralph well I felt out of my depth with the responsibility. Nevertheless I accepted the assignment and did the best I could. I didn't follow any rules and spoke from the heart. I decided to read a poem before the eulogy because I felt self-conscious of my short speech. I didn't rehearse and it didn't occur to me that I was going to be overcome by grief halfway through my speech. To cut a long story short, I blubbered my way to the end and was touched when, after the funeral one of Ralph's friends thanked me profusely. So don't be hard on yourself if it is your first time; the best you can do will be fine. (This eulogy lasted for 3 minutes speaking slowly and clearly). I would like to start by reading a poem in memory of Ralph. It is with sadness that we are assembled here today to pay our last respects to Ralph. I met Ralph three years ago. As a new member of the staff at ... one of my duties was to get to know the residents so I went to Ralph's room to make his acquaintance. What I found was a quiet and gentle man with a rather sad demeanour. He received me politely and this was the start of a mutual friendship. Ralph enjoyed the solitude of his bedroom, where he spent most of his time watching sports on TV. However he was happy to talk to staff when they came for visits and I visited him weekly. I enjoyed my visits with Ralph. He had a good sense of humour and a quick wit. Ralph was never married and one day I asked him why not, and he said: "I still might; here I am trying to woo you!" Ralph was an orphan and often talked about his difficult childhood; he was raised in several foster homes. Once I asked him if he had any good memories of his childhood and taking his time he answered: "Yes, a fishing trip where I caught 4 mullets and a ticket to the circus". He also had a challenging time in the army but considered his time there as 'good times'. He was a POW in Papua New Guinea and was awarded 5 bravery medals for his efforts. On Anzac day, I would sit by his bed and polish the war medals he was so proud of. His passing leaves me with a hollow feeling that I should have done more. I am comforted that Ralph is no longer suffering. Hi Solange, thank you for posting this. I am the lifestyle coordinator and I am working on an annual memorial ceremony for Elders that have passed on. The information is very timely and certainly something I can use. Again thank you for sharing this information. Thank you Solange for putting this topic & article together. It has been a great help to me in preparing the memorial service I am running later this week. I am a carer and a lifestyle coordinator. Thanks for giving me the opportunity to study about the eurogy - which is a new area for me. All residents I wanted to say "Good bye" individually, but didn't know how to say properly. Now, I can try at least. Many thanks, Solange. Solange, Your article is well thought out and written! Thanks!